My mom was going to throw out the decorated Easter Eggs she made in 1968. They were dusty, damaged and bug-eaten. Then she considered giving them to someone to salvage any useable trims. Of course I wanted them, cracked shells and all! They cleaned up beautifully. Egg tree eggs, made in 1968 by my mom. My sisters and I made some of these eggs, but not the prettiest. At first glance, these seem like really simple eggs compared to the lavish rubber-stamped, lace-trimmed, glittered eggs made today. 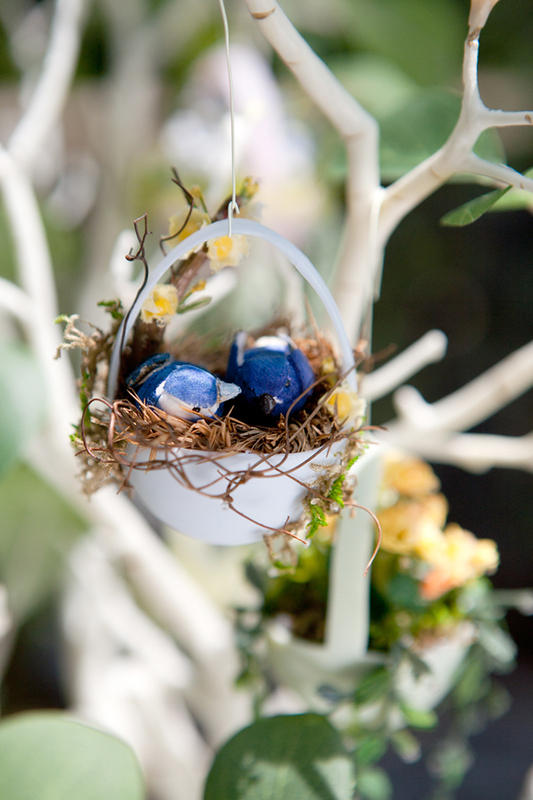 What makes these eggs so remarkable was the creativity with such limited supplies. My mom had very little to work with. She used poster paint, nail polish and a couple jars of my brother’s model car paints to paint the eggs. There was no shiny spray-on acrylic finish back then so she used clear nail polish to make them shiny. She purchased the gold paper trim from a mail order catalog from Lee Wards, a huge craft store in another state. There was no internet from which to buy craft supplies. There were no big Walmart craft aisles, Michael’s or craft stores. The only place for craft supplies was the local 5 & Dime store and even there, craft supplies were extremely limited. Some of these eggs are missing pearls, some have bent trim, some have cracked shells. 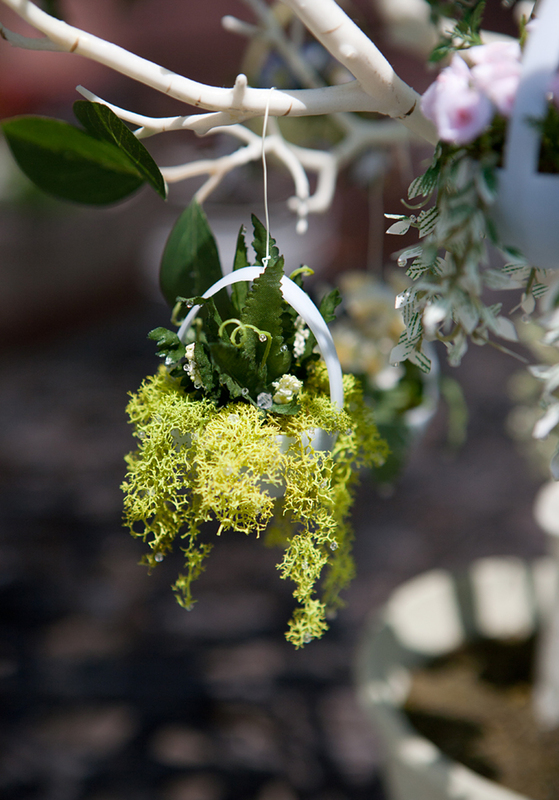 But when they are hung on the tree, they are all beautiful together. 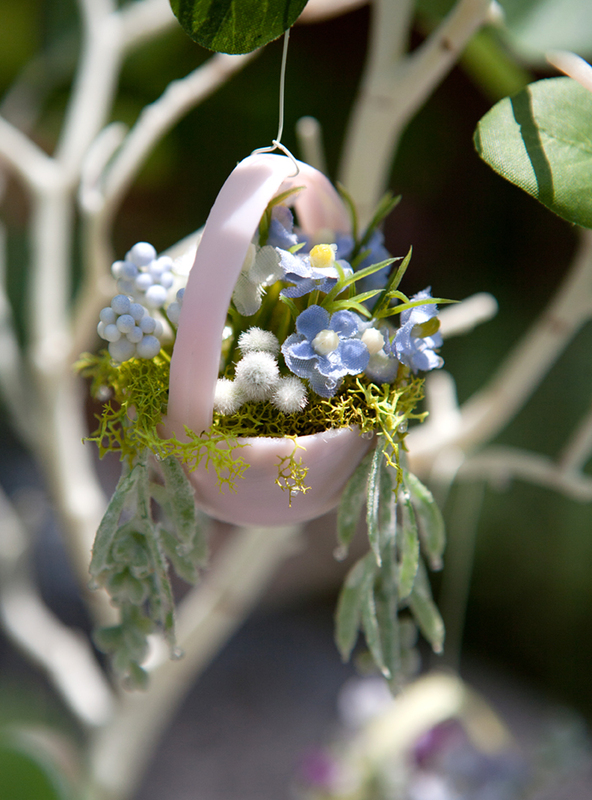 1968 Decorated Egg – the Blue Egg with a tiny plastic dove inside. 1968 Decorate Egg – The Purple Egg. 1968 Decorated Egg – My mom painted this egg with a jar of my brother’s model car paint. The plastic hollow sequin “gems” on each side were precious and I was in awe of them. 1968 Decorated Egg – The Yellow Rose Egg. A tiny sequin butterfly flutters above the plastic rose. 1968 Decorated Egg – Painted with poster paint, covered with clear nail polish. 1968 Decorated Egg – I love the spring green color of this egg. 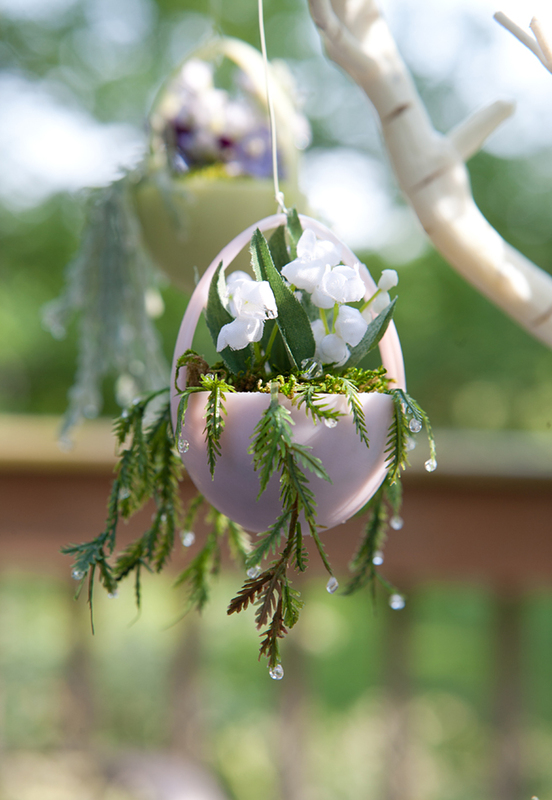 I have a couple plastic flowers like those used on this egg so I will restore it before putting it away at the end of the season. 1968 Decorated Egg – A pink sequin butterfly flutters over a pink fabric rose. My mom didn’t have much gold paper trim so she cut it apart and used pieces sparingly. 1968 Decorated Egg. – The Hot Air Balloon egg. 1968 Decorated egg – The Lavender Spiral egg. 1968 Decorated Egg – The Purple Rickrack and Gold Trim egg. 1968 Decorated Egg – Painted with poster paint, brushed shiny with clear nail polish. 1968 Decorated Egg – Painted with pink nail polish. 1968 Decorate Egg – The Bunny Basket Egg. This was one of the few eggs I made for the tree. Even though the bright colors didn’t fit in with my mom’s elegant color scheme, she graciously added it to the family tree. That’s true Mother’s love. 1968 Decorated Egg – The back of the pink rose egg, with a very design of pink rick rack and gold paper trim. 1968 Decorated Egg – my favorite: The elegant M Egg. I don’t know where my mom got the embroidered M trim. M was for our last name – Musser. 1968 Decorated Egg – The Lily Egg. I love how this egg has one side white, the other green. This egg was so shattered on the top that I had to flip it over and reattach the wire on the bottom so it could hang. The little plastic lilies were just tucked inside so they were easy to turn right side up. The only non-1968 eggs on the tree are the Peter Rabbit Eggs, purchased from Pottery Barn Kids several years ago. My mom used to read Peter Rabbit to my sisters, brother and I so I was thrilled to find eggs featuring illustrations from Peter Rabbit. Here Mrs Rabbit is fastening the brass buttons on Peter Rabbit’s blue jacket. Even though these eggs have missing beads and cracked shells, they are still so precious. When I look at them, I am reminded of simpler times, days of ingenuity, days crafting with my sisters, days of being read to by a mother that loved us. 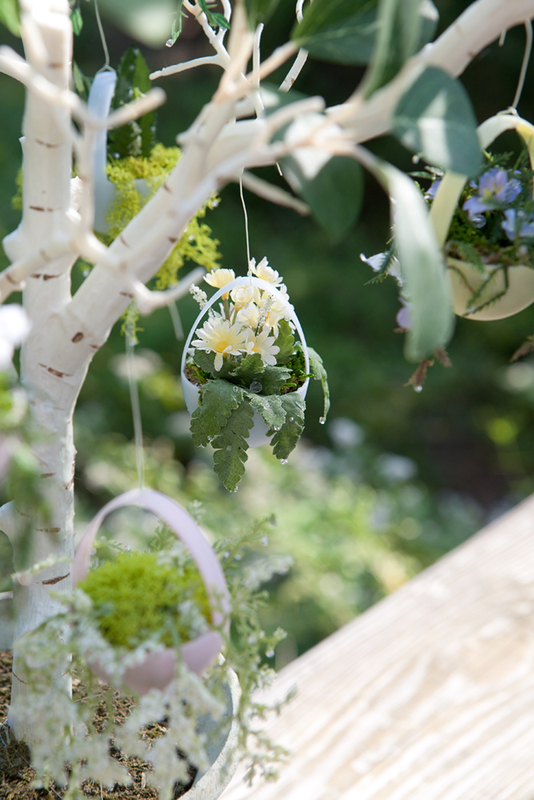 This little egg tree serves to remind me that it doesn’t take a studio of amazing craft supplies to make something all sparkled up, it just takes an eye for beauty and a determination to make do with what you have. The egg decorating kit looked spiffy, with pretty colors and cute rub-on decals of chicks, eggs and bunnies. But the decals didn’t stick at all. Not happy there. But we don’t give up easy so we rummaged around in my little box of scrapbook stickers and found a couple old sheets of rub-on decals from Valentine’s Day years ago. We had to think like an egg in order to figure out which words might work on an egg. Quite the stretch. Here are our eggs, which we put all in one basket. 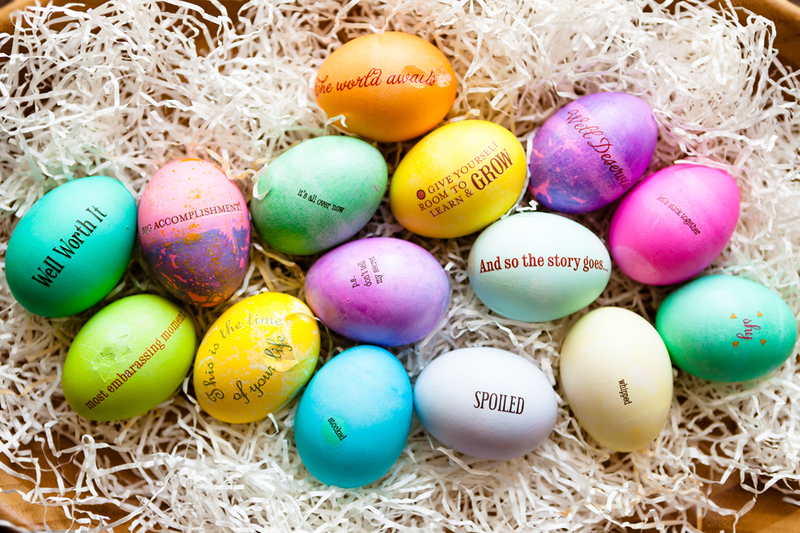 Easter Eggs 2012, decorated with rub-on decals - click to see a larger image. “Most embarrassing moment” on a cracked egg. 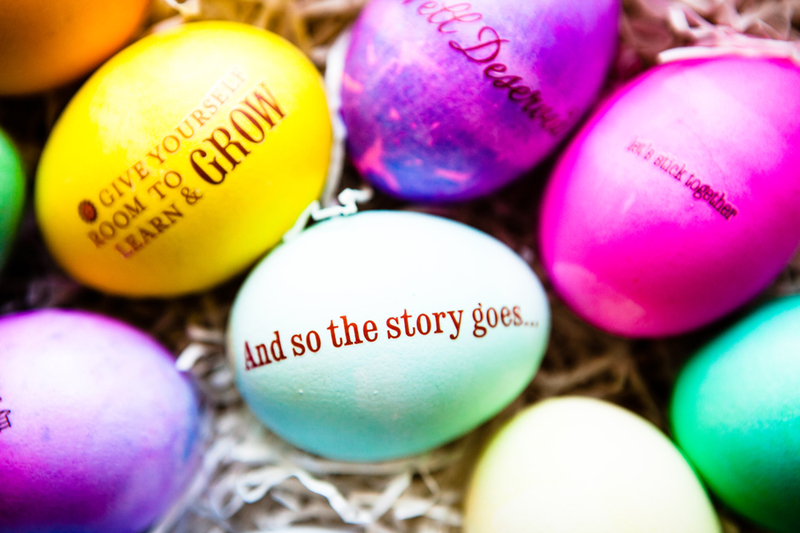 Also the egg with “And so the story goes…” Which came first, the chicken or the egg? 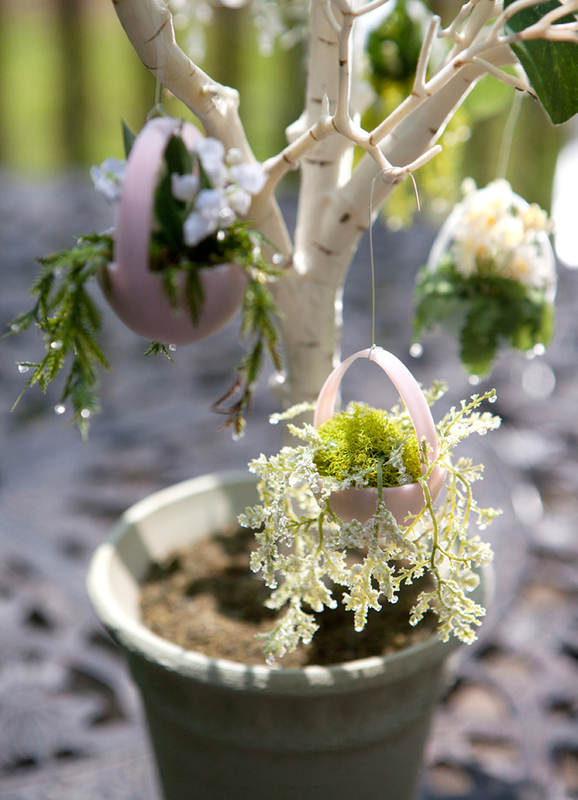 Last year I finally had time to make an Easter Egg tree and I’m happy to display it again this year. I’ve been wanting to make one for many years. 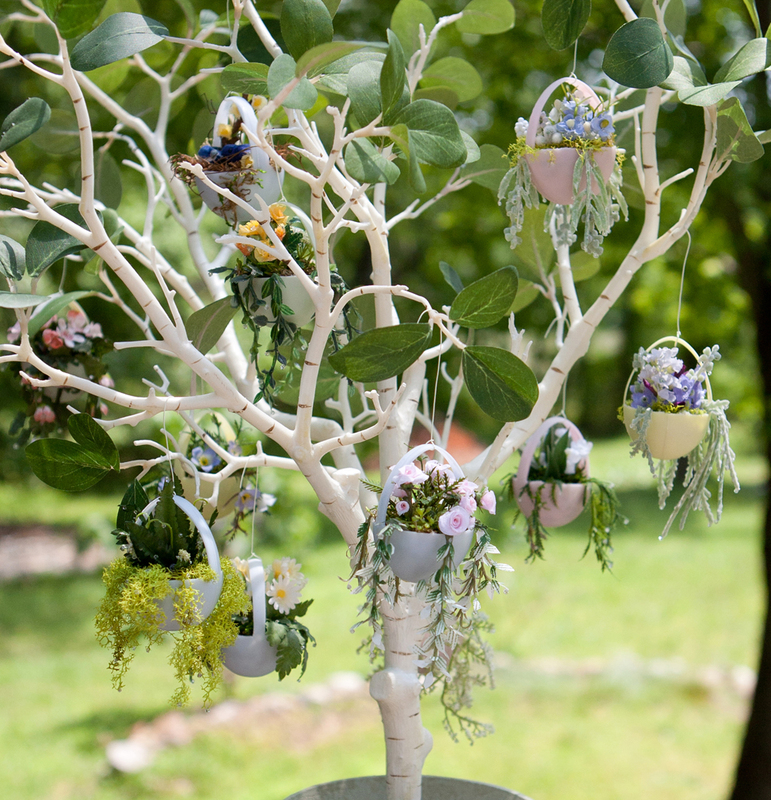 I have a couple precious decorated eggs left from the tree of my childhood and some day I will restore the eggs and call that tree my Heritage Tree. 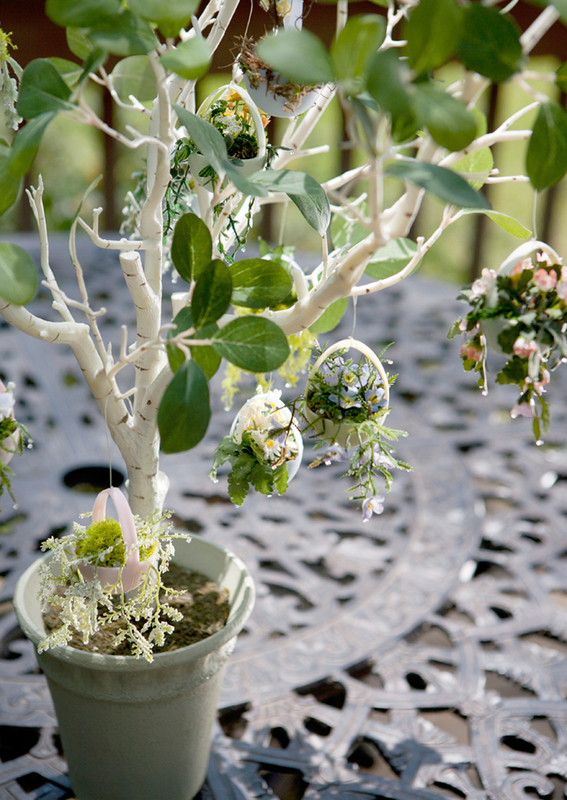 For now, this Hanging Plant Easter Egg Tree will adorn my dining room table. The tree was from Pottery Barn. The eggs are plastic, cut into little baskets with a craft knife. I made all the hanging plants from bits and pieces of full size artificial plants. 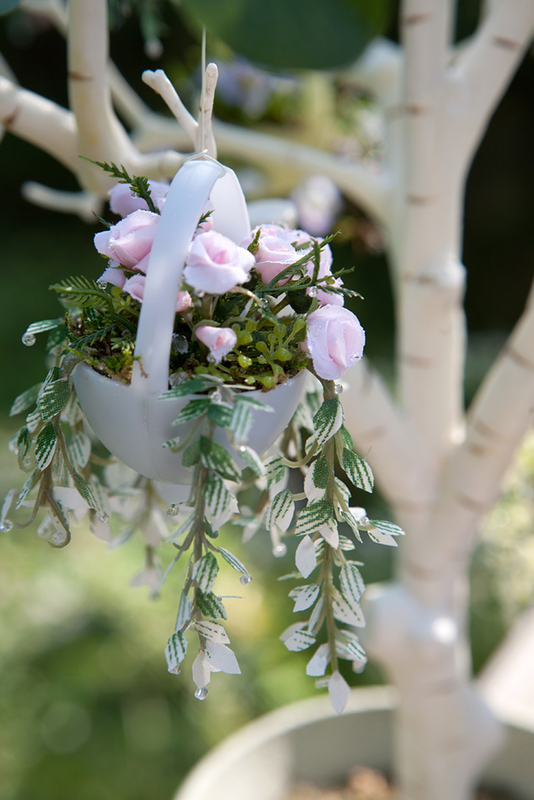 The hundreds of tiny leaves were cut out individually with manicure scissors. 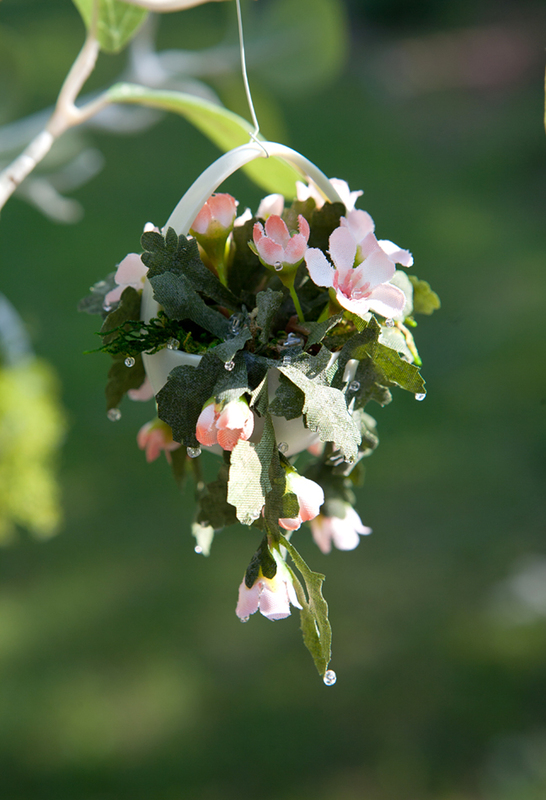 Crystal beads were glued strategically from the tips of petals and leaves to look like they were freshly washed with a light spring rain. 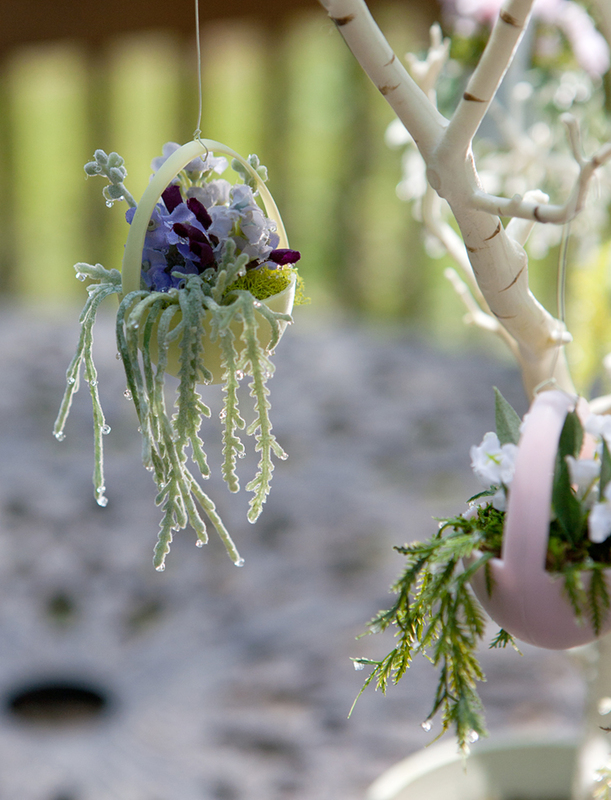 It took several weeks to make these eggs, working on them when I could during evenings last year. 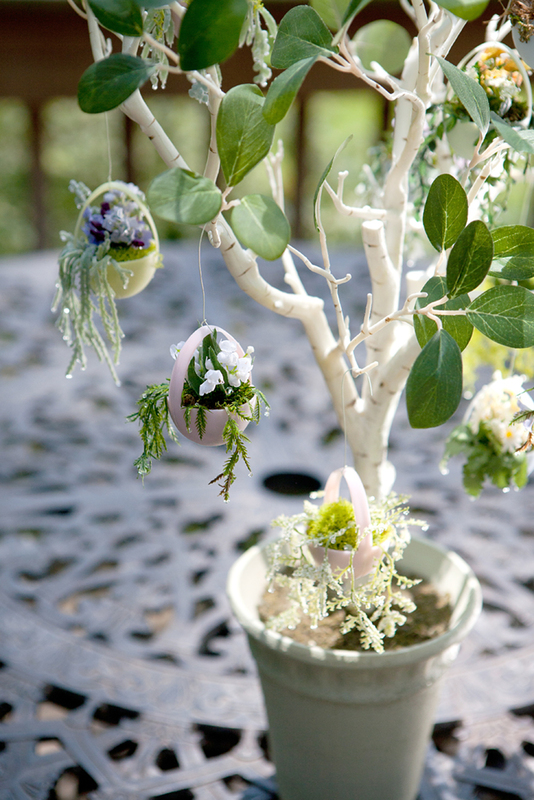 Easter Egg Tree - click photo to see a larger image. 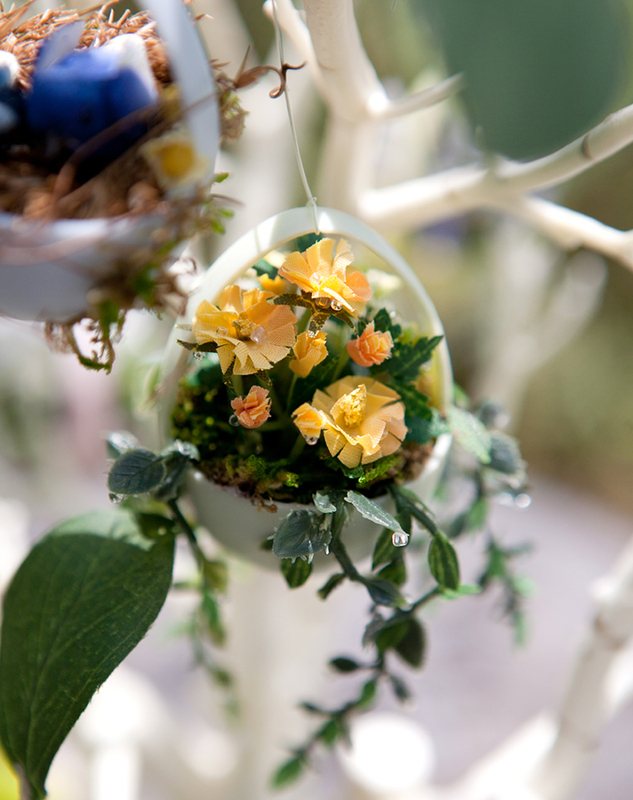 These little hanging plants are made from bits and pieces cut from artificial plants and flowers tucked into plastic eggs. Click on photos to see a larger image. Egg Tree - The Purple Egg.